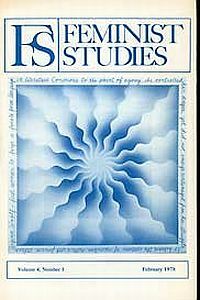 Founded in 1972, Feminist Studies was the first scholarly journal in women’s studies and remains a flagship publication with a record of breaking new ground in the field. Whether drawing from the complex past or the shifting present, the pieces that appear in Feminist Studies raise social and political questions that intimately and significantly affect women and men around the world. The journal publishes research and criticism that takes into account the intersections of gender with racial identity, sexual orientation, economic means, geographical location, and physical ability. No other scholarly journal also features artistic, creative, and activist output on the same scale: each issue contains multi-page full color art spreads alongside art essays, poetry and fiction, photo essays, and commentaries on newsworthy topics. Our issues typically contain thematic clusters of essays, creative work, and activist output, and our special issues (on topics such as Race and Transgender Studies, Women and Prison, Culture and History in the New South Africa, Chicana Studies, Conjugalities in South Asia, The Body and Healthcare) draw a wide readership. Although many of the articles we publish draw on the methodology of a single discipline, we especially welcome truly interdisciplinary research that showcases contributions from multiple traditions, sources, and methods. All accepted articles are reviewed by specialists in the author’s field and also by editors from a variety of disciplines. Our editorial collective includes scholars in literature, history, media studies, psychology, international studies, and sociology, and our editorial consultants are drawn from an even wider pool. Thus we ensure that each article meets the highest standards of scholarship in the specialized field and also is of interest to a broader interdisciplinary readership. With an acceptance rate of less than 8 percent, we are highly selective in choosing the content that appears in our publication.